FindItMore | You may be choosing the first ring of your life. You did not know much about jewelry before that time, but you will soon get married and put the ring on your finger. You do not know at all how to choose your wedding ring? There are often tips for choosing a woman’s engagement ring, how to match her wedding ring with her other rings, or how to choose her wedding attire … But there’s nothing about how to choose a wedding ring for men. , and especially an article written by a man!! So here are some enlightened tips for choosing a man’s wedding ring. How to choose the metal of a wedding ring for men? In theory, a wedding ring is for all of life, so it’s best to choose a metal that can survive all those years of passion and love! I recommend you choose an ultra-strong metal like gold for His And Her Ring Sets. It is a metal that lasts and that – for yellow gold and pink gold – keeps its color a lifetime. For the purists, know it, the most wear-resistant metal is still the platinum that keeps even more brilliance despite the time passing. Be aware, however, that the wear of the metal is seen especially on broad rings, like a ribbon ring. Wear is less visible on a fine men’s wedding ring, like a half-ring wedding band. These metals have a fairly high price and platinum is the most expensive metal of all. But if you want the best of the best, platinum is for you. But hey, love is priceless is not it! How to choose the color of a wedding ring for men? For the color of your wedding, it is a question of taste and also of habit. If you already have jewelry, it will be easier for you to choose an original wedding ring. The more discreet – those who are not used to wearing jewelry – will probably appreciate white gold or platinum. It’s more happening everywhere and it’s less bling-bling than yellow gold for example. The most traditional, who already have the habit of wearing a ring or a signet ring, will dare the classic yellow gold. It’s a safe bet, and it’s a very beautiful metal. In addition, you are sure to have a ring that will last in time, and especially to have a quality metal. Nothing to do with oil! In recent years, the black gold is a breakthrough in shops for a more modern effect. But beware, a men’s black gold ring is more “trendy” is less timeless than yellow or white gold. 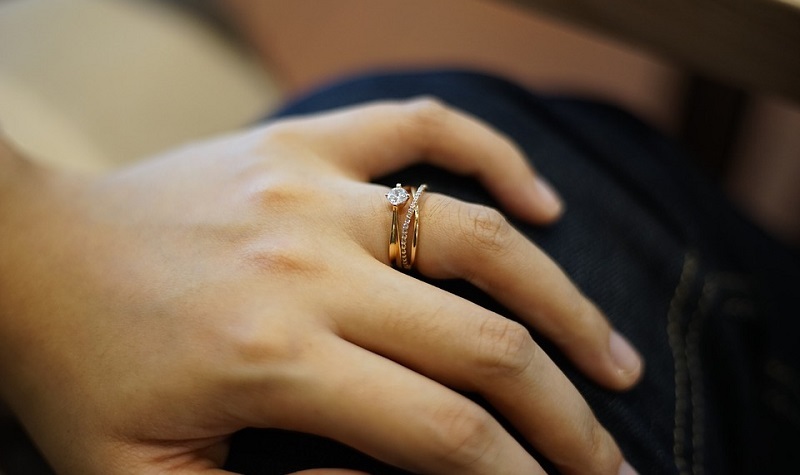 If you are totally used to wearing jewelry and you like it, you can even opt for a rose gold wedding ring . It’s pretty quirky but trendy. What form of ring to choose for a man? Now that you have chosen the metal of your wedding ring, you must also think about the shape of your ring. It’s a detail as important as color. Here, you will have the choice between two types of rings: the half-ring or the ribbon ring. Traditionally, a classic men’s wedding ring is a half-ring , a slightly domed ring on the top and flat on the side of the finger. It has the particularity of being particularly comfortable and solid. It is a discreet ring and easy to wear every day. We can also choose a ribbon type ring that is to say that the ring is flat. The appearance of the ribbon is a bit more modern and slightly less classic than the half-ring men’s ring. It must be able to assume because it is much more visible. It’s a question of choice! The thickness of the ring is chosen according to the tastes of each , however it is rather recommended for finger sizes less than 58 to opt for a 2.5 or even 3mm. Beyond, it will just assume to have a big ring on the finger. Conversely, if you have a finger size greater than 58, prefer the rings of 3, 3.5 or 4mm … it is still necessary that we see that you are married, right? A classic ring for men: with or without stone? So there are men’s rings with stones if you just want to go beyond the classic ring and give you a real gem. The option with stones will make your ring a unique and original jewel. But it may also be that you prefer to keep your originality secret and intimate, that’s why some jewelers like have imagined an ring in which hides – inside – a diamond . You are free to show it to whomever you want. I find this detail even more chic! Should marriage rings be granted? Some couples like to wear exactly the same wedding ring . But do not forget that the ring is also a personal issue that depends on your style, your skin and the size of your hands. The smaller the hands, the less the ring has to be wide for example. So if the person with whom you are getting married and you do not have the same hands at all, do not necessarily try to take the same model at all costs! The essential thing is at least to agree and to appreciate the ring of the other. Finally, if you do not choose the same model, simply does this test: put your hand next to that of your fiancé (e) and look at least if the two jewels, even different are harmonious. To engrave your marriage ring: a good idea or not? You now know everything to choose your ring. As D-Day is coming soon, we take the opportunity to congratulate you in advance for this beautiful moment, and I wish you to have the most beautiful wedding!